2.0 is an upcoming Sc-Fi movie of Superstar Rajnikanth. 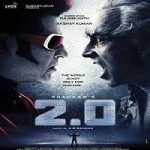 The film was earlier titled at Robot 2.0 which later changed to 2.0. The film is directed by S. Shankar and produced by Subaskaran Allirajah. The film also stars ‘Bollywood Khiladi Kumar’ Akshay Kumar. It is a sequel to Tamil film Enthiran. The film is scheduled to release on 25 January 2018.